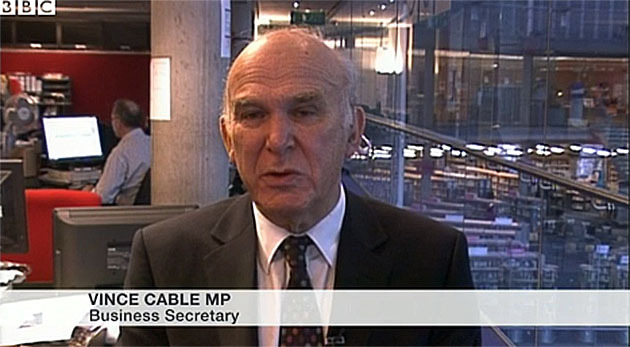 TheBlueGuerilla: Cable: I'm The 'Real Minister' For Portsmouth. THE WAR between the Conservatives and the Liberal Democrats in Portsmouth heated up further tonight when the Business Secretary, a close friend of council leader Gerald Vernon Jackson, attacked the appointment of Tory MP Michael Fallon as Minister for the city. Vince Cable said the appointment was "Tokenism and pointless" and even went on to claim in an interview with ITV News that he is "the real Minister for Portsmouth". Cable claims that because of the economic upturn businesses are "quing up to invest in Portsmouth." Not so long ago TBG recalls Cable being in close agreement with Shadow Chancellor Ed Balls that Britain was heading for a "triple dip recession."